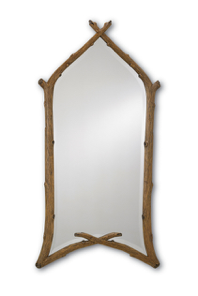 Rustic mirrors add a world of depth to vanity and living areas around your home. Whether you’re looking to bring the rustic feel of your common spaces into your bathroom, or you’re considering the addition of a full-length rustic mirror to your master bathroom, you’ll be adding a piece of functional decoration that is sure to turn heads. Placing a rustic vanity mirror in your master bathroom can make one of the most utilized rooms in your home even more comfortable and familiar. The new mirror will add layers of depth to your bathroom, whereas standard mirrors are purely functional and have little decorative benefit. When considering that rustic interiors become more desirable as layers are added, a wooden bezel encapsulating your mirror serves the exact purpose intended. Thinking about adding a rustic mirror to your guest or half-bathrooms? You’ll have the same benefit as you would placing them in your master bathroom, but more people will have the opportunity to appreciate the décor. Since the guest bathroom is likely quite a bit smaller than your master bathroom, you’ll be able to select a different mirror with the same look and feel to develop a unique depth to your entire home. Make sure you consult with a rustic interior designer before you purchase multiple mirrors to ensure you’re creating a consistent feel throughout your entire house. Does it fit? – As with any furniture purchase, you need to make sure your new mirror will fit in your bathroom. Take precise measurements and reference the specifications for the mirror you’ve selected. Make sure that the mirror is not overwhelmingly large for the planned placement, nor underwhelmingly small. Taking this step will help you avoid the headaches caused by heavy, difficulty returns or another long round of lead times & waiting periods. Does it match? 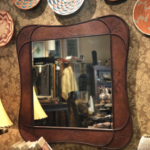 – When you purchase functional furniture like a rustic bathroom mirror, take an inventory of the artwork, decorations, and paint colors in the room surrounding the mirror’s planned location. Think of the overall feeling you’d like the room to create (Native American rustic, modern application of rustic influence, or something else) and make sure each decoration speaks to that feeling. If everything follows those guidelines, consider how the mirror will fit in with the surrounding décor. If you believe everything goes together, then the mirror matches. Thinking about making an addition to your home office? 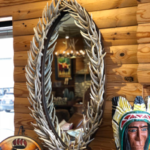 A rustic mirror could be the addition that makes you feel a bit less stressed when you’re drafting a contract, on a business call, or reviewing the performance of your business. Mirrors, by nature, tend to make a room feel larger than it physically is. Your office shouldn’t feel claustrophobic, especially with any metaphorical fires burning that you need to put out, and general work-related stress that follows you home for the office. Keep the masculine feel of your parlor alive by giving your home office equal attention in the decorating process. Our oval antler mirror, made of naturally shed deer antlers, is mounted on an oak frame and would, as you might expect, look great in a bathroom, hallway or over a chest in the bedroom. However, think about the impact it makes in your home office, especially when you have a smaller office that feels a bit tighter than you’d like. To make this look work in your home office, be sure to complement your new mirror with matching accessories for your desk or conference table. If you have a fireplace in your office, hang an impressive, elaborate mirror directly above it as a dramatic statement piece that also provides function. In smaller spaces, hang it above a rustic table displaying family photos or hunting and fishing memorabilia. Wherever you place rustic mirrors in your home, you’ll see an instant transformation. It also helps you customize your home and turn it into a private retreat that reflects your taste for natural, handcrafted furnishings, such as one-of-a-kind rustic mirrors.